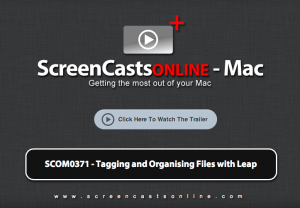 There was a nice screencast done about Leap at Screencastsonline.com. It is well produced, etc. Note that screencastsonline are not free, they publish an iPad magazine on Newsstand. Leap 3.1.3 and Yep 3.1.3 now have a nice new feature. When you select a file or multiple files, you can choose to ‘Email or Export’ the files. When doing these tasks, Leap and Yep now add all tags on PDFs as keywords in the PDF dict. This allows you to send tagged PDFs to other people via email, etc. Windows and Linux as well as other Mac users will see the tags you added as keywords on the PDF. If you don’t want this feature, simply export or email files by dragging from Leap/Yep into the destination, instead of using ‘Email or Export…”. Fresh – improved the spotlight search a lot – you can now restrict the search to a given sub folder. You can for instance find all the images in your downloads folder – to grab that image you downloaded last month. Fresh 2.0.8 also has a few smaller fixes rolled in. Yep and Leap – fixed a problem where Spotlight based search results could in rare cases show a recently moved file. Yep and Leap – fixed a problem with the folder column where a folder could be shown as selected, when it should not have been. Leap – added a new feature: Follow symlinks. In ‘Deep’ searches, Leap will now follow sym linked folders, including files in the search results in these folders. As a personal note, I am finding that I use the Spotlight feature of Fresh 2 much more, indeed finding it easier than Apple’s one for many searches. Usually I know the rough location of the item that I need. © 2019 Ironic Software | All rights reserved | Theme by Solostream.